We thought it would only be fitting to start the New Year with a new development and so today we have released a new “Mini-Dashboard”. We think it will make every Majestic user’s life a little easier as it brings all your reports and account details into one screen after login. This is the same whether you are on a free or paid account too. If you are logged in, just go to your “username” and “account” section to view the feature. It will store your verified domains, tracking reports, bucket list bookmarks, recent searches and current downloads. Just like before, you can easily use the Site Explorer or Search Explorer Search function from your landing page. But we noticed that we were wasting a lot of space on the page so have tried to make the section easier to navigate and enable you to get around Majestic much quicker. If you want to see what subscriptions you have and how much data you have left to use this month, just click on the number in the top-right corner for the information. Most people have only one subscription or none; (if you are on a free license). If you have more than one subscription though you may have extra API privileges. It is also possible to have (say) a silver and a gold account running at the same time. Usually you will not want this, so do use this to check that you have not inadvertently upgraded without cancelling an old account. We have deprecated the “news” feed to here. It is still easy to find, but in due course you will be able to minimize it when you have taken in any new developments, because below the news you get your personalized dash board. We will show it here. Right now we think our interns did some pretty cool stuff last year, so have a look at Majestic labs! Here your Dashboard starts to develop! 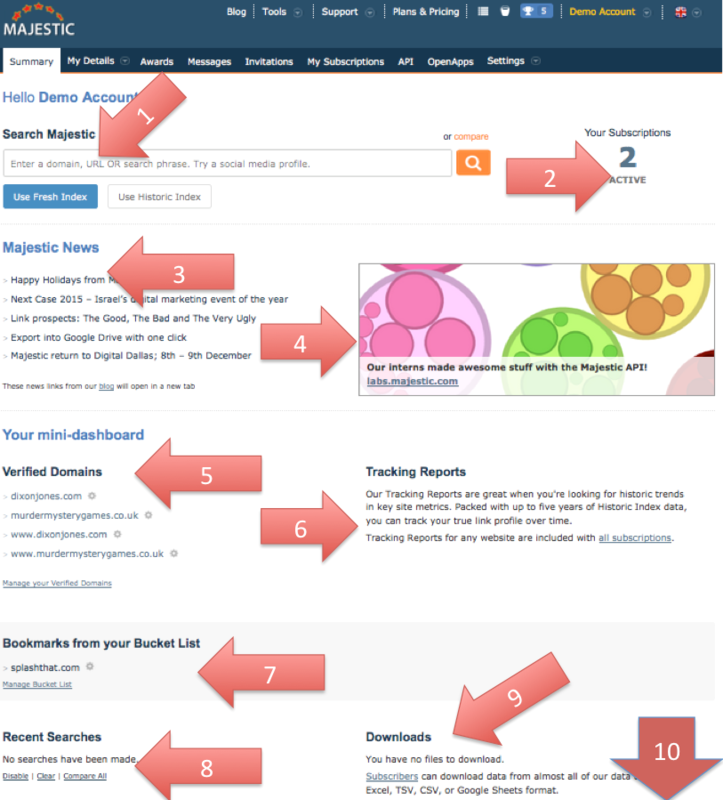 If you have verified any websites on Majestic, they will be listed here, giving you easy access to these reports. When you set up tracking reports, we start monitoring the link counts, Flow metrics and other data, so that you can see whether a site improves or declines over time. Sometimes it’s easier to forget what you’re following but via the dashboard the analytics you need the most will be at the touch of your fingertips. This is great if you use you Bucket List functionality – and if you don’t, then perhaps this will encourage you to start. If there are a bunch of sites or pages that you keep an eagle-eye on, then having them in your bucket list makes it really easy to compare them or drill into our deeper tools like “Clique Hunter”, which checks to see who is linking to multiple sites in any given set. Just like Google uses your browser’s search history, we can also do this to keep a short term track of recent searches that you have made on Majestic. We think that often, users come back to the same sites and searches time and time again, so this handy tool will make that considerably easier; (we hope). 9: Find your Recent Download Files. The more you use Majestic, the more you will be likely to export data files and reports. These are all stored on the server for a short period, so if you ever want to get back to your recent downloads, they will be there on your mini-dashboard. Once you have all this personalized information at your fingertips, you’ll hopefully find our tools much easier to use. So at some point you may get the chance to expand your horizons – whether it is API integration, or our How-to Videos and training or our Browser plugins and Google Sheets enhanced functionality. Why a “Mini” dashboard? And what’s next? In the long term we are hoping to make this page your permanent homepage after login, but want to make sure that we take this step with your feedback and thoughts in mind so let us know what you think through the comments section below or feedback button on the website. We have also taken the elements that we think are most useful to our users and that are easy to integrate from our side. However, our development team hope to use this and take your comments and suggestions to improve the numbers over the coming weeks and months. What would you like to see here? Comments and Suggestions will be considered with great care! We want to hear from you.